Dayton International has one large passenger terminal with Concourses A & B. The layout of the terminal affords quick transfer from entrance to gates. Recently, a new consolidated baggage makeup facility with automated in-line screening system and expanded checkpoint was added. The ground level is divided between the Arrivals area and the check-in area. - The Arrivals area to the west of the center has four baggage carousels & airline office of Southwest; across from the baggage claim are rental car counters and airline offices of United, Delta & American. The upper level offers food & drink and retail concessions, the Business Travel Center & a book store, as well as TSA facility. This level has access to Concouse B (at right) & Concourse A (at left). 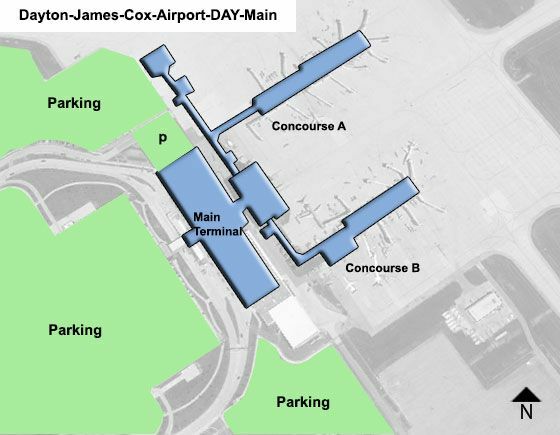 Concourse B with jet bridges & gates B11-B19 In the center is a Sports Bar with adjacent charging station, Quiznos & Dayton Marketplace.